The coccyx is the very end of the spinal column and was a tail in our ancestors long ago. Now, it serves no purpose, except to cause pain in a sizable portion of the population. 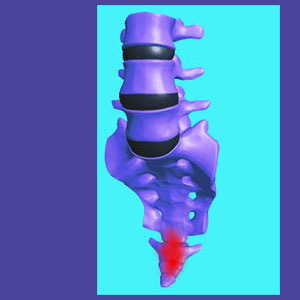 The only saving grace for patients who endure terrible and functionally-affecting coccyx symptoms is that the coccyx is not needed and will not disable them except possibly through the pain generated. This article explores coccyx pain syndromes from a completely new perspective. We will detail the usual causes of symptoms, including falls and traumas, but will also focus on lesser know origins of tailbone pain. We will also provide patients some helpful advice on coping with tailbone pain and provide guidance for those who are ready to take the steps towards surgical resolution of their suffering. The coccyx is the skeletal remnants of a tail, which has now shrunk considerably and resides completely inside the anatomy. When pain occurs in the coccyx and is persistent, the diagnosis is most often rendered as coccydynia or coccygodynia. This means that the tailbone itself is generating the symptoms though some mechanism. 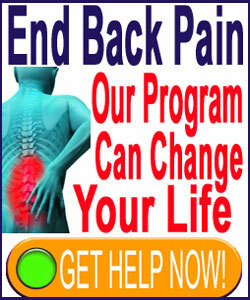 Coccyx pain syndromes have grown in numbers in the past 2-3 decades. Some doctors place the blame on the increased amount of sitting that is required of many modern office workers, but others look at the increase as a sure sign of the psychogenic nature of many coccyx pain syndromes. The human anatomy has certainly not changed in the past 20 years, but the incidence of many chronic pain conditions has. Not coincidentally, all of these conditions are commonly caused by the mind, rather than deficiency of the body. However, it should be noted that although mindbody causes are possible, there are also structural issues that can create persistent tailbone symptoms. Let’s take a closer look at the actual causes of coccyx suffering. In rare cases, the single coccygeal nerve root can suffer impingement before exiting the spine. This can cause localized pain is some patients, although often the pain will feel superficial at skin level and not deep at skeletal level. The coccyx is supported by a variety of soft tissues and these tissues are sometimes the cause of pain. Both muscles and ligaments attach to the tailbone, providing ample opportunity for soft tissue pain syndromes to exist. Some of these tissues are responsible for regulating the pelvic floor, which is why coccydynia is such as common symptom of general pelvic floor pain and dysfunction, especially in female patients. The coccyx is susceptible to impact trauma and can be bruised or fractured easily. Both bruising and fracture might take a very long time to fully resolve, although time should bring healing within weeks or months. People who demonstrate prominent tailbones are more prone to developing sitting and trauma-related pain. This pain might exist deeply or at skin level. More than half of the diagnosed cases of chronic coccyx pain provide no evidence of causative mechanism or pathology. These idiopathic coccygodynia cases account for the majority of coccyx removal surgeries performed worldwide. Coping with coccyx pain can be accomplished by limiting sitting and using a cushion designed to minimize pressure on the tailbone. Many patients find these devices to be very useful and allow them to lead normal lives, despite the underlying cause of pain never being resolved. Patients are warned that some designs, like donut cushions, can place inordinate stress on the pelvic floor or perineal region, possibly exacerbating pelvic floor pain syndromes or inciting hemorrhoids. Patients who experience pain that is not related to sitting will be in greater need for treatment, since these cushions will not help them much, if at all. Physical therapy is used for some patients, but demonstrates poor curative potential for persistent coccyx pain. Likewise chiropractic is sometimes utilized, but also is disappointing in its statistical outcomes. Drug therapies are considered effective for many patients, but come with major health risks that are often worse than the pain itself. Drugs must be used long-term, which also compounds their risks considerably. Coccyx removal surgery is a common treatment and is generally both effective and well-tolerated. The surgery might actually resolve some structural problem creating coccyx pain or might function as a very dramatic placebo treatment. Remember, many cases of tailbone pain are clearly psychogenic and have been treated very successfully using knowledge therapy. In fact, therapy outcomes from this form of non-physical treatment are the very best statistically, even edging out coccygectomy surgery. This is why we always recommend considering a mindbody model of causation before agreeing to any type of invasive care for stubborn coccyx pain.